Pound the Chicken Breasts to 3/8” thickness. Season the prepared Chicken with the Salt and Pepper and sprinkle with the Paprika. Dip the Chicken pieces in Flour and shake off the excess. Using a heavy 12” skillet, melt the Butter and Oil over moderate heat. Using tongs, transfer the browned Chicken to a plate. Pour off almost all the fat from the skillet, leaving only a thin film on the bottom. Add 1/2 cup of the Stock and boil it briskly for 1-2 minutes, stirring constantly and scraping in any browned bits clinging to the bottom and sides of the pan. Return the Chicken to the skillet and arrange the Lemon slices on top. Cover the skillet and simmer over low heat for 10- 15 minutes, or until the Chicken is tender when pierced with the tip of a sharp knife. 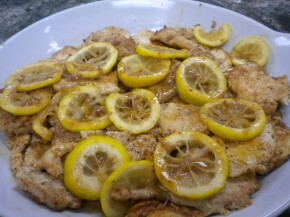 To serve, transfer the Chicken to a heated platter and surround with the Lemon Slices. Add the remaining Stock to the Juices in the skillet and boil briskly until the stock is reduced to a syrupy glaze. Add the Lemon Juice and cook, stirring, for 1 minute. Remove from the heat and swirl in the 2 Tablespoons of soft Butter and pour the Sauce over the Chicken.